On Miss Rockwell’s [Mary Rockwell Hook] first visit to Pine Mountain in 1913, she and Miss Pettit and Miss de Long made a plan of growth, foreseeing the needs of the School much as they have come to pass; and this plan was closely followed. As far as possible, native materials were to be used, the trees and flowers growing on the grounds to be saved, as little as possible brought in from the outside. There has been constant emphasis on the saving of everything worthy in the children’s lives, — folk-lore, traditions, old customs, the beauty of the place, everything that was the base of Pine Mountain’s cultural atmosphere if the children were to learn to live new lives. The frequent “working’s” at Miss Pettit’s [Katherine Pettit] house have gathered in the old neighbor women, and there has been much talk of old times. One year a “pioneer dinner” was cooked and served at the Old Log House. The Fireside Industries Department has gathered up recipes for dyes and methods of work of early times. Workers and children have been educated on the saving of all wild growth, the flowers, laurel, holly and rhododendron that covered our hills. 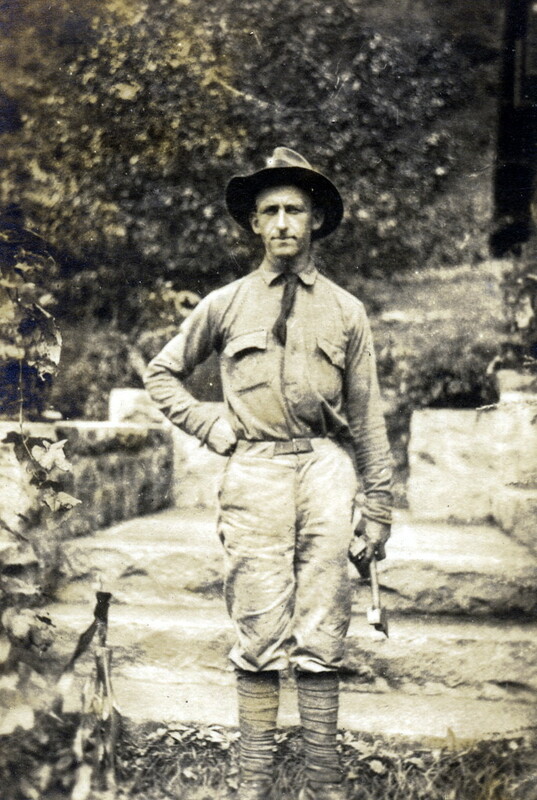 Mr. Leon Dechamps, a Belgian, a trained forester, came in 1916 to do a demonstration piece of forestry on our land, called “The Perfect Acre“, and did besides much constructive work on our woods. At one time there was an effort to interest Henry Ford in buying the timber at the head of Isaac’s Run to save it from being cut. In the early simple days of a small family, neighbors came and wen, workers visited informally up and down the creek, we were all called by our first names, Aunt [Sally Dixon Creech] spoke to us of “Your Uncle Will”, referring to Uncle William Creech. In 1917 the school had grown so in size and its life had become so absorbing, that workers were definitely given a day a week when they were expected to go out and get acquainted with the neighbors. We recalled at this time that Dr. Frost [William Goodell Frost] of Berea used to insist that all new workers spend their first two weeks before coming to Berea, in visiting in the mountain homes, and understood why he had thought it so important. The weekly visiting day was not kept up regularly but the point had been made that friendly contact with our neighbors was necessary, and workers who have stayed at Pine Mountain any length of time have always had real friends in the countryside. Their understanding of the children in the school has varied directly with their knowledge of the children’s background. Pine Mountain’s growth is the result in great part, of help and interest on the part of the workers, who have always been in the confidence of the school. They have known of our financial straits and of our good fortune whenever a big check came in; they have helped us develop the policies of each department. Living in close contact with the children, they have subscribed to the requirements which had to be made more frequently than in other types of schools, and have simplified their own lives and wants that they might be in keeping with the school’s first five years; then we had staff meetings, which in turn were discontinued in place of departmental meetings and executive memoranda. Introduction to your job at Pine Mountain meant reading the “Worker’s Book” as much as leaving your home address in the office. Good literature, of real literary quality and well printed, has always been sent out. The Notes, inaugurated in 1919, have in particular kept to our high standard. The Notes were started at the suggestion of Mr. W. A. Bradley, [William A. Bradley] the writer, who interested his friend, Mr. Hal Marchbanks, the printer, in getting them out for us at cost price. 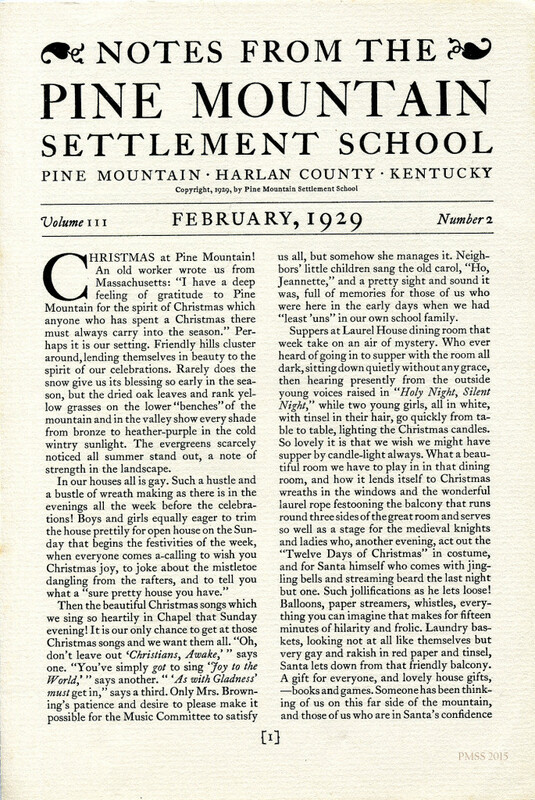 Pine Mountain was one of the first mountain schools to adopt an impersonal attitude towards its scholarships, pooling all gifts, even those the exact size of a scholarship, in one general fund. Givers of scholarships knew that their contribution was keeping one child in school, but had no direct contact with the child, hearing in the school’s acknowledgment letters about different children. There has rarely been any singling out of a child for special attention, — the children have “shared and shared alike.” The Executive Committee have never felt for a moment that they made any mistake in starting the school on this policy. In 1919 the policy, followed till then implicitly, was put definitely, that we never buy new equipment or do new construction work without first securing the funds for it. In the early days, our children came from homes where there was no money, and often their tuition came in the form of chickens or eggs or potatoes or labor. We supplied clothing for them because it was literally impossible for them to get for themselves the type of clothing we wanted them to wear. Sewing societies sent in rompers and bloomers and middies and nightgowns, and our household cupboards were stacked with piles of underwear from the Needlework guilds. Then with the growth of the mining towns and consequent increase in the flow of ready money, with improved mail service everywhere and the catalogues of mail order houses in every home, it was possible, and preferable, for the children to equip themselves before coming to school. The second-hand clothing that we sold to neighbors until 1925 became more and more a destructive influence in building up self-development. Now, with the exception of a needy student now and then, the children come equipped with clothes of their own acquiring. Of course, they are not as well dressed as we would like them to be, but they are learning. In the same way, the giving of Christmas presents has been gradually decreased. Christmas presents were practically unknown in the homes of the children in 1913; we can remember the impression it made, the first time a child at Pine Mountain got a Christmas present from home. Now those children whose home is really the school, and who actually spend the day with us, have their stockings filled, of course; but the others depart to spend the day at home with just one gift from the school. During the war (WWI), the tradition of rice -and-cocoa dinners was started by the children as a means of raising money for starving Europe, and later we contributed to other causes. the remark of William Gross, then aged seven, “I aim to save my d’sert and put hit in a match-box and mail hit to some little starving ‘Velgian'” started us off. We chose the famine ration dinner, a bowl of rice and a cup of cocoa, for dinner for the whole school, by which seventeen cents a person was saved and pooled. Rice and cocoa dinners have always come at the children’s suggestion, and in this way, in 1917, $108.00 was sent for Belgian Relief, and $20.00 to the Red Cross. In 1920, to pick out an especially interesting year, $40.00 was sent to Central Europe and $83.00 to Armenia, and $65.00 to the Near East. In 1921 we sent $101.00 to the China Famine Fund. With Dr. [Abby] Little in Armenia and Lilliath Robbins in China, these gifts became very real for the children. Organizations among the children have not flourished at Pine Mountain unless they were started by the children themselves. 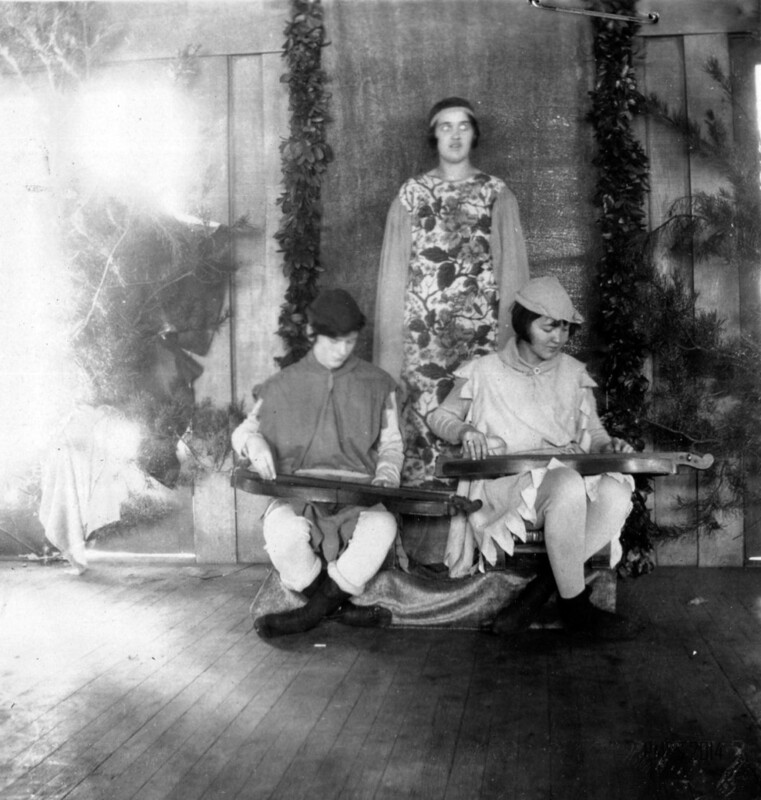 Practically the only one to stand on its own feet was the Mountain Girl’s Association, and that disbanded in 1928 after some six years of real influence in developing public opinion in the school. Membership involved your intention to finish high school, not to marry until you were eighteen not to go with boys who drank. There were Boy and Girl Scout troops for a few years, well organized and well directed, and much excellent work was done, but the growing busy life at the School and the fact that many lessons of scouting were taught in other departments of the school made existence too difficult and unnatural for them. In the summer of 1922 Allie Callahan and Kitty Ritchie were sent on scholarships given by Mrs. J.J. Storrow to the Girl Scout camp at Long Pond, Plymouth, Mass., and in the following summers, two girls went to Camp Proctor on the Ohio River, sent by troops interested to raise the money. The girls of the school since 1923 have had a branch of the 4-H Club, sending delegates to the state camps every summer, under the direction of Mrs. Browning. The Athletic Association was launched in 1926. Behind all the growth of policy and tradition in the school has been the ideal of slow, gradual development, the “invisible molecular force” that cleaves the rock more effectually than the blows of a hammer. [INDEX] Early in-depth history of Pine Mountain Settlement School consisting of 22 sections gathered by Evelyn K. Wells from 1913 to 1928. EVELYN K. WELLS PMSS Harvard University Talk on Folk Music, July 21, 1955.